This criminal law casebook contains excerpts from the most important South African judgments on criminal law. Some shorter judgments are printed in full. Each case is preceded by a brief summary of the facts in the law followed by a note explaining the importance of the judgment. 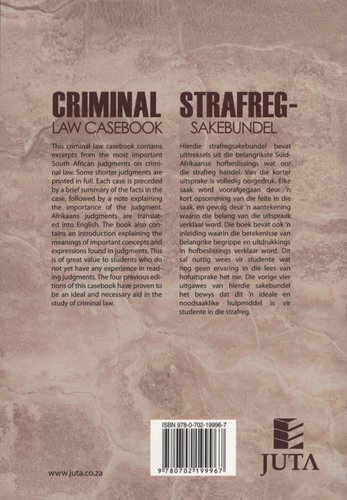 Afrikaans judgments are translated into English. The book also contains an introduction explaining the meanings of important concepts and expressions found in judgments. This is of great value to students who are inexperienced in reading judgments. 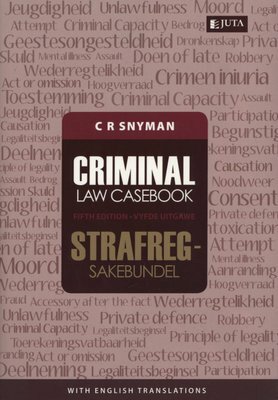 The four previous editions of this casebook have proven to be an ideal and necessary aid in the study of criminal law.